Recently, I was on retreat with an amazing group of women friends. It is an annual event that includes lots of reflection, music, prayer, wine, and chocolate. And a labyrinth. 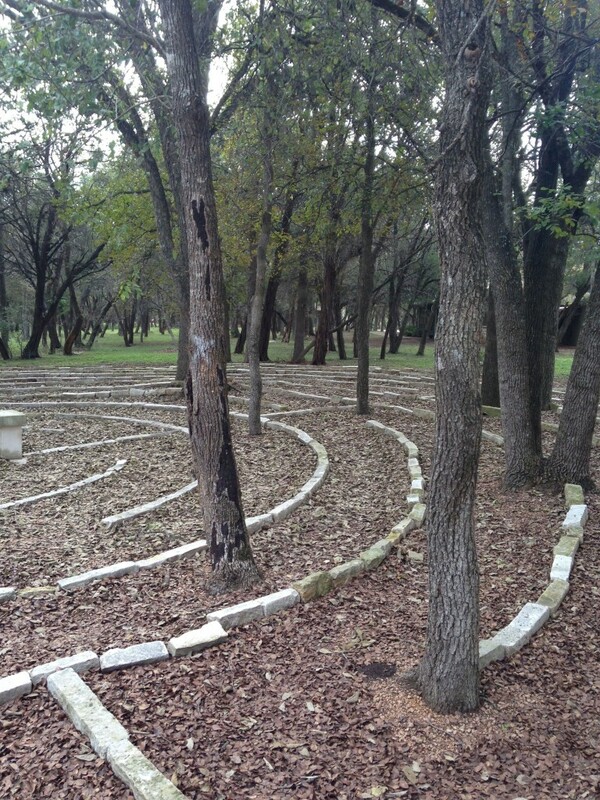 The labyrinth at our retreat center is outdoors and made from stone, wood, and dirt–a locally sourced labyrinth. Walking it, you hear the crunch of leaves and small stones under your feet. Wind and sun and clouds and temperature all become part of the experience, so each time you make the journey it is a little different. I’ve always walked this one with a group and the labyrinth is big enough so that you can be in community and in your own space at the same time. Like all labyrinths, this one will teaching you something if you pay attention. Insight, healing, serenity, and grace…if that is what you are seeking you can probably find some of it as you stroll that winding path. For me, a long, slow walk to the center and back quiets the noise in my head from a loud and busy life. But here is something different: this labyrinth has trees growing all through it. Some help mark the way, others are smack dab in the middle of the path itself. It is impossible to make this journey without encountering and then finding a way around the trees. The first year those trees were a buzzkill; mid-meditation I had to stop, navigate, then re-group. In year two, I was nearly able to ignore the trees as I made my pilgrimage to the center and back again. This was my third year and it was the charm. I paid attention to the trees as I sidestepped some, ducked others. There are a couple that you literally cannot pass unless you hug them. This is what I learned from the labyrinth: Sometimes you have to embrace your obstacles. So I hugged those trees on the way to the center and hugged them again on the way back. Here is another thing the labyrinth reminded me: like all spiritual journeys the path of a labyrinth does not end at the center, it sends you back to the world again with whatever you learned along the way. So now that I am back in the swirl of my everyday life, I am hugging all the trees in my path: my argumentative son, my talk-til-she-drops daughter, my broken water heater, and the crazy-busy job I love. My path would not be the same without them. P.S. If you are really into labyrinths, check out this great mediation written by my friend the Soul Curate here.